The Tale of the Missing Vampire Mint Plant. The interesting aspect about mint is the fact that it lives forever - literally. My mint plant started with a few springs from my lovely elderly friends. They both sat there last summer and told me that all I had to put them in water and then just watch them grow. So I did this. Soon, I had a large bushy mint plant. I added it in lamb and all kinds of dishes. Mint is a bit like a vampire because no matter how much you try, you can't actually kill it totally. It will arise at the next dawn apparently. I didn't know this during my first attempt at developing mint. Mint With Bite. It never dies. A new gardener prowled our land during that particular time. Apparently, one summer's day he was clearing up. He cleared up alright. He had mistaken my mint plant for a grubby weed and thrown it in the dust bin. Of course, I was distraught. Soon the entire family gruffed that " Rita was in a mood because her master mint plant had got lost in the garden bins". It wasn't just a "mood", I was positively huffing and even chocolate had not tamed me. Not about to give up the mint plant for dead, I started to huff at the gardener by text. Finally, after digging in his brain for about 2 hours, he found the memory packet that held the location of the mint plant. Apparently, it was at the bottom of one of the twenty bins he had put out for collection. No one appreciated the care I had put into my mint plant and why I was distraught that it had been killed. By this time I had obtained the information about the missing mint, it was nearly midnight. While everyone had gone to bed, I hopped outside dressed in nightdress and dressing gown to hunt for my mint plant remnants. My idea was this - if I could salvage the roots, it would revive itself much like the vampire. All I had to do was replant it or take a few strands and place it in water. It would grow after a few days. Afterall, the mint plant had sentimental value as they were given to me with love by my elderly friends. So started the rummaging through the twenty bags. During that period, of course, I was not a happy bunny. Infact, I was a very unhappy bunny. So, while I was rummaging around, neighbour number 1 started to ruffle their curtains, soon its relatives were at the window. The neighbour number 2 started to twitch their curtains as did its family. Then the opposite door neighbour decided to open the door and walk out to ask if there was anything he could do to assist. I simply stated I had lost something and was searching for it.
" In your nightdress and large bunny furry slippers, Rita," said one neighbour. 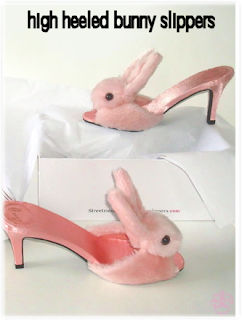 Yes, well, I didn't expect an audience who technically should have been fast asleep and not staring at my rather quaint high heeled bunny slippers. Then of course as is always the case, the police drove by. They stopped to ask if there was anything they could do. What was I going to do, ask two tall officers to look for a missing mint plant? I mean the week before they had lost a pig's head and failed to locate it. I found that rather surprising really. On all these occasions, the best policy was to smile sweetly, act totally dim and simply carry on. The police asked whether I always wore slippers like that.
" Is there a law against it officer", I said with a cute smile. Having waved to the police and uttered a few unlady like words under my breath, I continued to rummage through the bins. I came across the "roots of the mint plant". Of course, I was elated and I said "Good Night" to my bemused neighbours and hopped back into my house. Of course, I am infamous for tending to my plants at night. I took the roots to the emergency operating table in the greenhouse and started the process of re-potting. I was quite proud of myself to have the original roots of the sentimental plant given to me by my elderly friends. At least I had saved it. That is of course, the tale of the above mint plant. The mint plant has lived for two years since its attempted assassination attempt. The above picture was taken two days ago. 1. All About the Mint Plant. 2. How to grow mint. 3. Gardeners World. How to grow mint from cuttings.